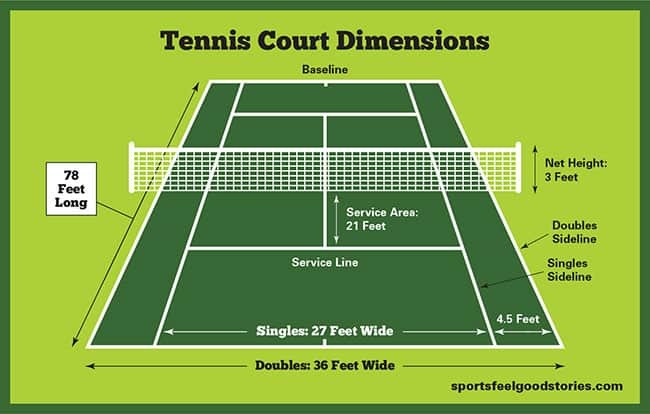 Tennis court dimensions vary depending on singles or doubles. Singles tennis uses the inner sidelines for determining an out-of-play shot and doubles tennis utilizes the full court width out to the outer, or doubles sidelines. The quick answer for size of a tennis court for singles is 78 feet by 27 feet. For doubles, 78 feet by 36 feet. The International Tennis Federation (ITF) determines the official dimensions and measurements for tennis courts. Here are dimensions for a regulation, adult-size tennis court. Single players use the narrower width for the dimensions of a tennis court for singles play (designated by the inside singles sidelines). The court length is the same for singles and doubles matches. Court length: 78 feet (23.77 meters) long. But, the width is different. Doubles match rules allow players to use the full court width, all the way to the outer doubles sidelines. The doubles court extends 4.5 feet beyond each side of the singles court sidelines. Court width: 36 feet (10.97 meters) wide. At 36 ft wide, there’s 9 more feet to cover compared to the singles’ court. A center service line divides the service area on each side of the net into two rectangles. These areas represent the space in which the served ball must land. The size of each area is the same for both singles and doubles matches. The tennis net stretches across the width of the court, dividing it equally. The net is attached to posts on either side of the court. The center point of the net is about 6 inches lower than its height at the posts due to it’s weight. The net posts are located 3 feet (.91 meters) outside the sideline for both singles and doubles matches. Here are tennis court measurements for those looking to build their own backyard court. The area required for a home court is determined mainly by available space, but it is recommended not to build a court within a play area smaller than the minimum size. Sizes below represent the entire play area required (tennis court plus outer clear space). Extra space is required surrounding the court sidelines and baseline to accommodate player overruns. The following is the recommended clear space that is needed around the court. Smaller tennis courts for children: The ITF has determined that children under 10 years of age are better able to learn the game of tennis on smaller size courts, using slower orange, red and green balls. There are a variety of surfaces used in the game of tennis. The major surfaces used in tennis include clay courts, carpet courts, grass courts and hard courts. Hard surface courts are the predominant surface for most indoor courts. Each surface has its own unique characteristics. A key aspect is how quickly the ball moves on the surface. Grass and hard court surfaces tend to play fast while clay plays slow. What Tennis Court Surfaces are used in Grand Slam tournaments? Australian Open – hard tennis courts. US Open – hard tennis courts. French Open – clay tennis courts. Wimbledon – grass tennis courts. Who was the first African American to win the US Open Tournament? What is the fastest tennis serve’s speed? Australian Sam Groth’s serve hit a top-speed of 163.7 miles per hour (263.44 km/h). What did the first women to participate in the Wimbledon tournament wear? At Wimbledon each year, how many strawberries are consumed? Who played in the longest tennis match? 11 hours and 5 minutes. In 2010, John Isner beat Nicolas Mahut at the Wimbledon Championships. What is the maximum tennis racquet length allowed? How long have yellow balls been used at Wimbledon? Since 1986 – originally, white tennis balls were the choice.